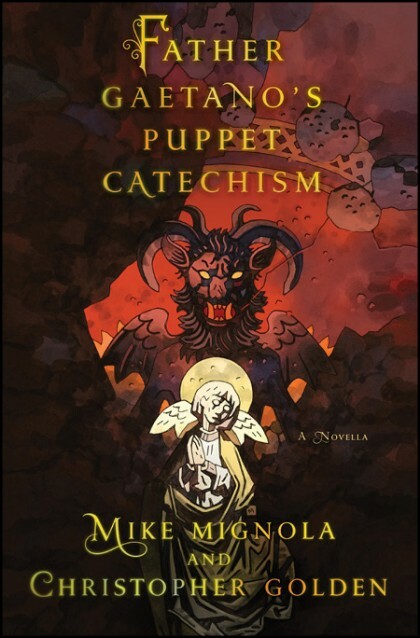 SETH’S PICK :: Father Gaetano’s Puppet Catechism Illustrated Novella: This is the latest collaboration between Hellboy creator Mike Mignola and writer Christopher Golden, following Joe Golem and the Drowning City and Baltimore, which started as a novel before turning into several comic series. The joy of these books lies in their simplicity. Mignola and Golden don’t presume to try to reinvent any kind of literary wheels, they just tell straightforward horror stories. This one is set in World War II era Sicily and follows the troubled lives of orphans. If the dregs of war weren’t enough, the orphans have to deal with a haunted puppet theater. Like I said, there’s nothing especially unique about the premise, but thanks to the creators its bound to be an entertaining read. And for those of you who don’t like books without pictures, don’t forget that this one is aided by Mignola’s illustrations throughout. I can’t wait to read this! Great write-up Seth… yet I’ve gotta say I also enjoy judging these books by the cover. :^P Freaking gorgeous!!!! I’m not sure how I missed news of this coming out! I’ve been a fan of Christopher Golden’s for many years now…ever since I read the first two books in his vampire series (Angel Souls & Devil Hearts, etc) back when I was in high school. Afterwards, I got hooked on a pretty awesome X-Men trilogy book series he wrote. And Mignola…the man is top notch on many levels. This is definitely gonna be something I get ASAP.